Emomalii Rahmon, president of the Republic of Tajikistan, inaugurated a new National Reference Laboratory for Public Health 4th September in Dushanbe. 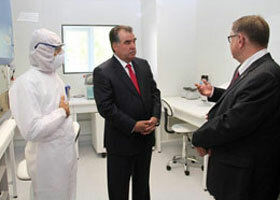 Emomalii Rahmon, president of the Republic of Tajikistan, inaugurated a new National Reference Laboratory for Public Health. The Tajik Ministry of Health and the United Nations Development Programme asked Fondation Mérieux to contribute its expertise to the design and equipment of the laboratory, which was financed by the Global Fund. Dedicated, in particular, to the detection of multi-resistant tuberculosis strains, the new laboratory has a surface area of over 400 m2 and comprises two BSL2 and BSL3 laboratories for pathogens that require a high level of biosecurity. HE Mr. Didier Leroy, French Ambassador to Tajikistan, HE Mr. Alexandre Zuev, UN Resident Representative in Tajikistan, and Mr. Benoît Miribel, Director General of Fondation Mérieux took part in the inauguration.